10 moments that show the versatility and usefulness of this lovely—and, sadly, much-maligned—four-stringed instrument. The ukulele. Since it went from a pillar of jazz to a largely mass-produced plastic instrument manufactured by the millions in the Forties, Fifties and Sixties, the ukulele has been on the receiving end of a fair share of scorn from guitarists. This criticism though, isn't terribly fair. In defense of the ukulele, we here at Guitar World have collected 10 videos that show the versatility and usefulness of this lovely four-stringed instrument. Paul McCartney, George Harrison and Ringo Starr—"Ain't She Sweet"
Taken from the 1995 Anthology documentary series, here the surviving Beatles get together on a summer day at Harrison's house. Harrison, who was a big fan of the ukulele, leads this casual sing-along of "Ain't She Sweet," a tune the Beatles performed in their earliest days. A very cool moment to see these musical giants gathered around a uke. Jake Shimabukuro—"While My Guitar Gently Weeps"
Racking up over 16 million views on YouTube—and one of the site's first viral videos—this clip introduced modern day ukulele virtuoso Jake Shimabukuro to the world. Since then, the Hawaiian-born musician has become a living legend of the instrument, and this is the video that started it all. A list of the top ukulele moments would not be complete without Israel Kamakawiwoʻole. Known to his fans as Iz, the musician passed away in 1997, but his medley of "Somewhere Over The Rainbow/What A Wonderful World" has become ingrained in Hawaiian culture, living on in countless films and shows. Though he's best known as the frontman for durable hard-rockers Pearl Jam, Eddie Vedder has always had a huge soft spot for the uke. 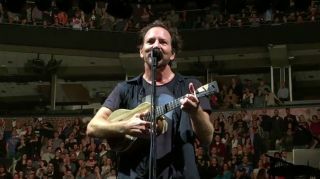 "Soon Forget"—a solo uke-and-vocals track from Pearl Jam's 2000 album, Binaural—served as a preview of Ukulele Songs, a 2011 album from Vedder comprised entirely of just his unmistakable voice and a ukulele as accompaniment. "Sleeping By Myself" is one of the album's standout cuts, a beautiful, forlorn track that shows Vedder at the peak of his songwriting powers. Hawaiian ukulele virtuoso Taimane Gardner, who has been playing since she was knee-high to Don Ho, kicks things off in this incredible clip with a version of the James Bond theme before moving into "Stairway to Heaven" territory—and well beyond. Not only was Roy Smeck extremely proficient on the ukulele, he wasn't too bad on banjo and guitar either, earning him the nickname "Wizard of the Strings." Here he's featured in an old film demonstrating a tapping technique decades before Eddie Van Halen. While Brian May is well-known for his homemade "Red Special" guitar, he also played ukulele or banjolele on some of Queen's campier material—a perfect example being "Good Company." Taken from the band's breakthrough LP, A Night at the Opera, the chord progression was written by May during his early grade school years when he first learned to play the uke. I can see you rolling your eyes, but unless you've been living in a cave for the last decade, you've heard this song once, twice, or a few million times. There's a reason though, that Jason Mraz was able to launch himself into record-breaking ubiquity with "I'm Yours." Mraz gets an impressive amount of mileage out of the song's bright, bone-simple riff, which starts out—as shown in the live video above—on a uke. Honoka Katayama and Azita Ganjali were 15 & 13, respectively, when this astounding display of ukulele virtuosity was recorded. The Hawaiian instrumentalists were named MVPs of the 2013 International Ukulele Contest in Honolulu and—from the video above—it's easy to see why.